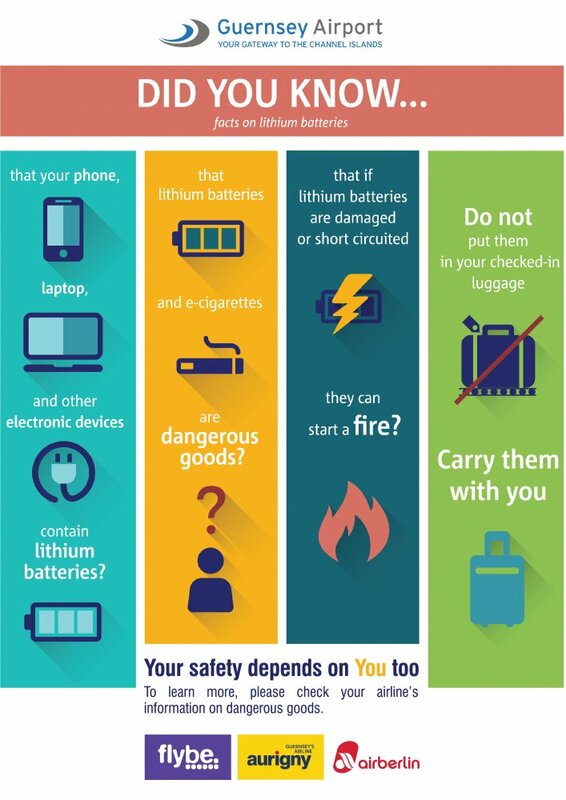 Did you know that your phone, laptop and other electronic devices contain lithium batteries? Lithium batteries and e-cigarettes are dangerous goods. If lithium batteries are damaged or short circuited they can start a fire. Please do not carry them in your checked-in luggage; carry them with you. The following information is taken from the current edition of the International Civil Aviation Organisation Technical Instructions for the Safe Transport of Dangerous Goods by Air. Restrictions implemented by other countries in the interests of aviation security may further limit or forbid the carriage of some of the items. Additionally, airlines and security screening agencies have the right to refuse the carriage of certain items. Passengers must contact their airline in advance for clarification of the regulations, or when planning to travel with dangerous goods that require the airline’s approval. Lithium metal batteries: Generally non-rechargeable batteries that have lithium metal or lithium compounds as an anode. Lithium metal batteries are generally used to power devices such as watches, calculators and cameras. Lithium-ion batteries: A type of rechargeable battery commonly used in consumer electronics. Lithium-ion batteries are generally found in mobile telephones, laptop computers, etc. Lithium batteries should be carried in hand baggage only. Follow this link to view our Facts on Lithium Batteries poster.